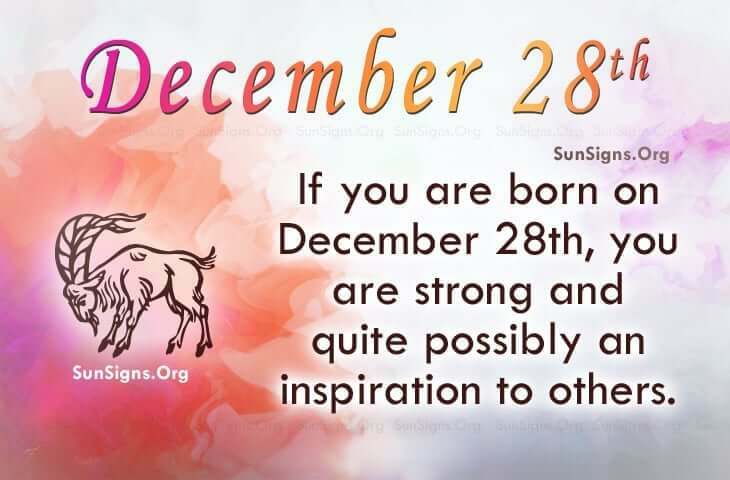 Famous people born on DECEMBER 28 are likely a Capricorn who is strong and quite possibly an inspiration to others. They have a great deal of courage that is required of a leader such as themselves. They’re pretty good with numbers so they could easily have a career using this talent. If this is not an option for them and if they would like a more structured environment, then the military could be the way to go. However, with this group or organization, they will need to be on point with their debts as they are not always otherwise. Marriage is something that famous celebrities of December 28 take seriously. When they decide to jump the broom, it will probably last a life time. They don’t know when to quit. However, with all of the attention they receive, it may be hard to notice one individual as being outstanding but their soul mate is out there. They will be some luck to have this Capricorn as they are true-blue and reliable. Famous people born on DECEMBER 28th stay away from people and their drama. This turns them off. Traditionally, they like solitude so they can relax. They’re resourceful Capricorn and don’t need anyone to tell them that they are significant. They’re strong… mentally and physically.